3D printed bionic arms for children may soon be available through the NHS as the world's first clinical trial of a 3D printed bionic hand is granted a groundbreaking second stage. Open Bionics and Deus Ex become Guinness World Record holders for first prosthetic limb based on a videogame. We’ve entered the record books for creating the world’s first prosthetic limb based on a videogame and transformed our good friend Dan Melville into a real-life Adam Jensen from Deus Ex, the cyberpunk videogame series set in a near-futuristic era of transhumanist body upgrades. Dan’s fully functional bionic arm doesn’t allow him to smash through walls, but it’s certainly smashing world records. Open Bionics win Start-Up Of The Year, Health and Care Award, and Robotics International Award For Good. It’s been a very exciting few months here at Open Bionics HQ and we’re thrilled to have won a handful of awards including a $1 million UAE AI & Robotics Award for Good, Start-Up Of The Year at the British Engineering Excellence Awards and a Bristol Health & Care Award for Best Innovation. We’re working with the NHS on a world first clinical trial to make affordable bionic hands available for children in the UK, turning children with limb differences into superheros. The hand, printed in a flexible material, took just over 24 hours to print on a desktop Ultimaker 3D printer, and was programmed to perform six different actions. Last week we ran our first batch of object testing with our latest 3D printed prosthetic hand design. We’ve been experimenting to find out which grip modes will benefit amputees most. In the video below you will see objects being handled that are different weights, heights, sizes, and shapes. We also had a mix of rigid and flexible objects, and objects with handles and without. We chose to test 25 objects selected from amputee feedback and academic research. Most of the objects were pointed out as being a ‘must be able to handle’ by amputees, if this bionic hand is to be useful for everyday use. We found this research on ‘Role Analysis of Dominant and Non-dominant Hand in Daily Life’ very helpful. The bionic hand in this video is capable of handling 5 kilos of weight and demonstrates this by picking up the loaded shopping bag. https://www.facebook.com/openbionicsltd Open Bionics tries out another round of objects testing. This is a 3D printed bionic hand in development for amputees. This test was designed to see how our bionic hand can manipulate objects. You’ll notice this test wasn’t performed by an amputee. We created a 3D printed handle to test the hand because we didn't want to inconvenience an amputee volunteer for every test run. We'll share this handle design with you soon. We have since tested with an amputee and we’ll share that video with you next week (check out the sneak peek below of Dan picking up a marble). Short video showing a congenital amputee manipulating a marble with our 3D printed bionic prosthesis controlled via EMG sensors. This prosthetic also has proportional control. This means amputees can choose how much power to move their fingers with, this affects the speed and force of grip. So, an amputee can hold a bottle and choose to squeeze the bottle harder if they think the bottle might slip. Although a lot of the testing was about handling objects, some of the grip modes are there to make gesturing easier. For example, the ‘index finger point’ has been highlighted to us as really important by amputees who use a split-hook or cosmetic prosthesis. Sometimes it can be a struggle to accurately point things out when you don’t have a working index finger. We've been using micro gel finger tip grips to give the fingers more friction. If you know a better solution please share your idea with us on our forum. All of the grip modes demonstrated in this prosthetic hand can be found in our robotic 'Ada hand' for researchers and makers. The 'Ada hand' isn't built to be a prosthetic but a research platform. We are still developing our prosthetic hands. Next week we’ll show you how this bionic hand can be used by an amputee to manipulate various objects and perform everyday tasks. We’d be really interested to know if there are certain tasks you’d like to perform easier, or certain objects you’d like to be able to grip better. Let us know by tweeting us or writing in the comments on Facebook! Today Open Bionics announced the release of their first open source 3D printed robotic hand kit. The ‘Ada hand’. The team, based in the UK’s Bristol Robotics Lab, have released their first robotic hand called ‘Ada’ complete with tutorials, detailed build instructions, and bill of materials. Check it out on their website or on Instructables, Thingiverse, and Youmagine. The project is currently featured by editors on Instructables. Open Bionics said they wanted to offer the robotics, maker, and 3D printing community the easiest to make open source robotic hand, and this release can be built within an hour. Instead of spending tens of thousands on robotic hands for research robots like Baxter, Open Bionics says build your own for £500. The Ada Hand is a fully articulated robotic hand from Open Bionics. It is a kit of parts and can be assembled in around 1 hour using standard tools. The hand has 5 degrees of freedom (DOF) and can be controlled from a PC or MAC over USB connection. The Ada hand houses all of the actuators required to move the fingers as well as its own custom control printed circuit board (PCB). The PCB is based around the ATMEGA2560 microcontroller and can be programmed using the Arduino programming environment which will be familiar to many developers. The Ada hand is perfect for anyone that is doing a project with robotic hands or wants a neat, light, and functional robotic hand for use with a humanoid robot. Open Bionics’ ‘Ada’ hand is very different to the original ‘Dextrus’ hand. The print and assembly time has been made radically faster and easier. Joel Gibbard, Open Bionics’ CEO, said the team wanted to make robot hand building easy. “We know there are hundreds of people around the world that really want to contribute to designing a fantastic robotic hand, both for applications in robotics and in prosthetics. At the moment there is a large barrier to entry to getting involved in this project and contributing to developments. With the Ada hand we want to remove that barrier. The hand is 3D printable on an FDM desktop home printer and can be assembled in an hour, we’ve also created a developer community so people can sign up and post their developments in our forums. We’ll constantly be suggesting bite-sized projects for developers to take on and taking feedback from them about what else they need." “I think one of the big barriers to people making and starting projects is a daunting magnitude of the build and a lack of documentation, instruction, and guidance. We are trying really hard to make sure we have detailed and easy to follow assembly instructions, comprehensive data sheets, and lots of tutorials to suit all levels of ability. Part of this move is to encourage developers to post their research in the newly opened Open Bionics’ developer forum. Open Bionics named their robotic hand after Ada Lovelace, celebrating Lovelace’s contribution to programming. This was a big release for Open Bionics. In the week since the developer forum opened they’ve had 109 makers, engineers, and amputees sign up to contribute to our research and development. Open Bionics is an award-winning robotics company creating affordable 3D printed bionic hands for amputees. 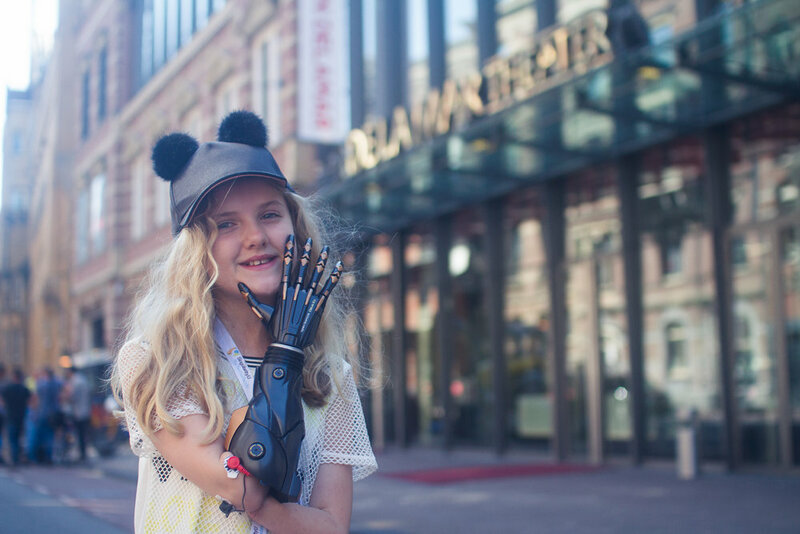 Last year they announced a deal with Disney to create official Iron Man, Star Wars, and Frozen hands for amputees. Join the Open Bionics developer community! 3D print your own hand with a print time of 24 hours or buy an assembly kit with all components here. 10 reasons why one hand is better than two. 1. You can create the most legit cosplay outfits. @aannggeellll as Furiosa from MadMax Fury Road. 2. Free running. You’re one limb lighter so you can jump further. Check out James Rudge Parkour. 3. You can have a *snake* arm. Alternative limbs are so freakin' cool. 4. Chores? A thing of the past. 5. Halloween costumes can be gloriously gory. From your cyborg drummer, Jason Barnes. 6. You can hack your prosthetics. Want a colourful 3D printed version? Make one for free! Print your own with design files here. 7. You can look like your favourite hero. Iron Man anyone?! Open Bionics will release these soon. Prototypes by Open Bionics tested by Avenger Sydney and Jedi Logan. 8. You get compared to the best sci-fi character of all time, a lot. 9. Characters with one hand are always badass. There are so many awesome amputee / cyborg characters that we had to dedicated a new post just to them. Click here. 10. You’ll never be caught without a bottle opener. Our friend Jason (@koger84) tricked out his prosthetic socket with family photos and a bottle opener. Top 10 fictional hand amputees. We were discussing the best amputees in movies and games so we made this list. Enjoy! 1. Furiosa of Mad Max Fury Road. 2. Merle of The Walking Dead. Please don't make this at home. 3. Buster Bluff of Arrested Development. 4. Jamie Lannister of Game of Thrones. A prosthetic hand made of gold? Sounds heavy. 5. Adam Jensen of Deus Ex. The bionic amputee of the future. 6. Winter Soldier of Marvel's Captain America. This hunk of metal would make an epic cosplay prosthesis. 7. Big Boss from Metal Gear Solid. Half man, half machine. 100% badass. This Star Wars villain was mostly machine, in fact. Perhaps the most famous bionic hand in the universe. We could totally 3D print that. Open Bionics has teamed up with a researcher at the University of Bristol to create a dual material, custom, 3D printed splint for people with broken wrists. Abby Taylor and Open Bionics' mechanical engineer Jonathan Raines created an innovative 3D printed medical splint by combining PLA and Ninja Flex (a thermoplastic elastomer) with two extruders on a desktop 3D printer. Abby, who is based at the University of Bristol and has a PHD from the University of South Australia, had an idea for a lighter and more convenient cast that could greatly improve life for patients. The researcher asked Open Bionics to help her bring her idea to life by using their 3D scanning and 3D printing methods. Open Bionics did so by 3D scanning Abby's wrist before applying a Voronoi pattern to the model and then 3D printed a custom-fitted, dual material splint. The design combines the strength of PLA with the flexibility and softness of the filament printed on the inside. The flexible material also acts as a living hinge, meaning patients can get in and out of the splint with ease. This first print which fit comfortably, is a sign that 3D printing could enable patients to have an improved splint that's 'way more integrative' with the daily life of the patient. Open Bionics estimated that the material costs for the splint, which prints in one part, is just £2. The innovative startup will be supporting Abby's research into alternative medical casting for broken or injured wrists for the next year while continuing to develop their low-cost bionic hands.